H.Res.121 was introduced by Rep. Mike Honda, a Japanese American from California who spent his early years in a concentration camp with his family under President Roosevelt’s executive order 9066, and co-sponsored by 167 members of the Congress. Similar resolutions had been proposed in the past, including in 2006, but were not voted on. In 2007, a series of controversial statements by Japanese Prime Minister Shinzo Abe as well as the publication of a comfort women denial ad The Facts (2007) in The Washington Post propelled the resolution into passage. (4)should educate current and future generations about this horrible crime while following the recommendations of the international community with respect to the comfort women. The agreement consists of two separate announcements by foreign ministers, followed up by a telephone exchange between Japanese Prime Minister Shinzo Abe and South Korean President Geun-hye Park. There is no actual agreed-upon statement to be ratified or endorsed by parliaments in either country. Under the agreement, Japanese government would contribute 1 billion yens (about $10 million USD) to a fund set up by the South Korean government, which would provide disbursement to South Korean former comfort women to “heal psychological wounds.” Japanese government insists that the payment is not a reparation, and does not represent an admission of legal liability. As soon as the agreement was announced, it was denounced by surviving victims of Japanese military comfort women system both because the governments did not consult them about the agreement and also because the agreement fell vastly short of survivors’ demands, or demands of the U.S. House of Representatives in H.Res.201 (2007), including the full acknowledgement of the Japanese military’s involvement in the trafficking of women, further investigation and prosecution of those involved in the crimes, formal apology through parliamentary resolution or cabinet statement, legal reparation to victims, and the inclusion of comfort women history in history textbooks. Survivors in Taiwan, the Philippines, and other countries also protested the agreement because it offered the disbursement of funds to South Korean survivors only. In the political turmoil leading up to the impeachment of President Park in 2016, many opposition party leaders and presidential candidates are pledging to nullify the agreement. Meanwhile in Japan, fringe extremist groups such as Global Alliance for Historical Truth and Nadeshiko Action call for the repeal of the agreement, while some establishment conservative groups affiliated with Japan Conference applaud Abe’s successful deal with South Korea. Kono Statement (慰安婦関係調査結果発表に関する河野内閣官房長官談話) is a 1993 statement by the Cabinet Minister Yohei Kono (河野洋平) which is widely seen as a formal admission by the Japanese government of the role Japanese government played in the recruitment, transfer, and control of comfort women during the WWII. Comfort women deniers have since been calling for the retraction or backtracking of the statement or delegitimizing it by dismissing it merely as a personal opinion of Kono himself or a political compromise lacking any actual evidence. In particular, comfort women deniers criticize Kono Statement for “falsely” acknowledging the direct involvement of the Japanese military in the forcible recruitment and kidnapping of women for use in the military comfort stations. Japanese government has backtracked on this portion, explaining that it was in reference to a specific case of the military discipline breakdown, and not applicable to the recruitment of comfort women in general. Japanese Ministry of Foreign Affairs parrots Kono Statement as the evidence that Japan has already taken responsibility for its role in the abuse of women under the military comfort women system, such as in response to the proposal in San Francisco to establish a memorial dedicated to comfort women, the wording of the statement leaves ambiguous what responsibility the Japanese government is acknowledging, especially it backtracked on the part that addresses the direct involvement of the Japanese military in the forcible recruitment and kidnapping of women. In February 2014, Deputy Cabinet Minister under Kono at the time the statement was released told the parliament that the administration at the time did not verify testimonies of comfort women surveyed by the South Korean government, and it was “possible” that South Korean government was involved in the drafting of the statement. Prime Minister Shinzo Abe ordered an investigation into the process behind the release of Kono Statement and released a report in June of that year, which was seen as a way to delegitimize and backtrack Kono Statement while avoiding diplomatically costly retraction. Co-signed by dozens of political and public leaders in Japan, the ad is often said to have accelerated the passage of the house resolution by giving credence to the notion that Japan had not fully accepted historical responsibility, rather than preventing it. Nonetheless, the group published a similar ad, Yes, we remember the facts. (2012) five years later. 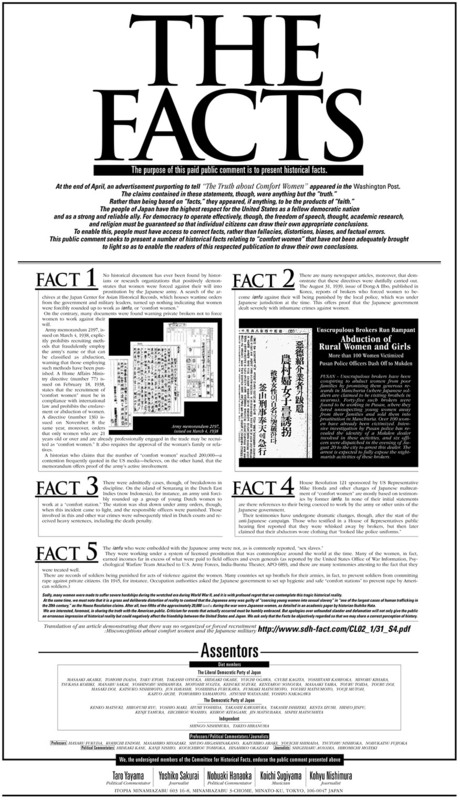 The ad features five “facts” regarding comfort women, which are the same old denier talking points debunked long ago. Below is the list of endorsements for the ad. 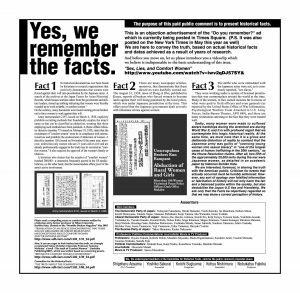 “Yes, we remember the facts.” is a paid advertisement published in the November 6, 2012 edition of The Star-Ledger, a daily newspaper in New Jersey, by a group of Japanese comfort women deniers calling itself the Committee for Historical Facts. 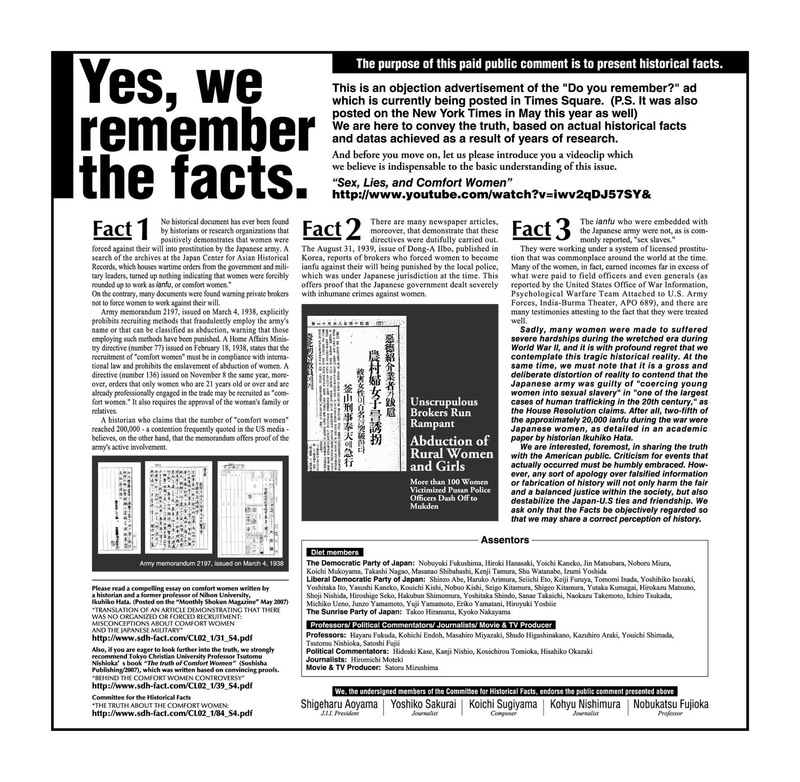 It is a revised version of The Facts (2007) ad, published in the June 14, 2007 issue of The Washington Post. The ad recycles the same old comfort women denier arguments. The publication took place six months after Palisades Park, New Jersey turned down Japanese officials’ offer of one hundred cherry blossom trees in exchange for removing a small plaque memorializing comfort women. The ad also included a long list of endorsements.